Congratulations to the Court of Final Appeal (CFA) and the Judiciary Administration on the launch of its new website yesterday. The CFA-related content on the Judiciary's main website remains for now, but probably only until that site is revamped. 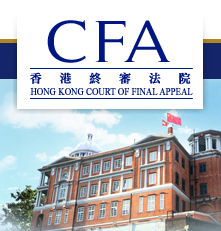 There is a new CFA logo, which shows an attempt at branding. The new website is attractive and provides improved public access to a significant amount of information about the Court, its judges, its procedures, its operation and work. While much of the information can already be found in the main website, there are a number of new features worth mentioning. First the biggest improvement is in the information on forthcoming cases to be heard. We are given the calendar until June 2015, so three months in advance, showing the basic details of the case including the panel of judges that will hear the appeal. It would have been better if the website provided more details of the points to be argued such as the certified questions of law upon which leave was granted. Hopefully someday there will be access to the submissions filed by the litigants (see update below). Another improvement is the greater transparency given to Rule 7 cases which disposes of a large number of leave applications without a hearing. The Who's Who section humanises the Court and provides useful information on present and past judges and registrars. The section on judicial assistants is effective in serving to elevate the profile of these positions to continue to attract talented young lawyers. Another useful section is the list of speeches and articles by the Chief Justice and other judges, both past and recent. Judgments were always readily available on the main website but now there is a link to the HKLII website, a project of HKU's Law & Technology Centre. As with all new websites, the moment after it is launched, one is already thinking about the next version. Increasingly final court websites around the world provide more video content (not to mention broadcasts of appeal hearings), they use social media to interact more with the public, and they allow users to sign up for alerts or RSS feeds to keep up with the latest decisions and news. Hopefully these and other innovations will find a place in the current or future versions of the website. UPDATE: The Printed Cases of the parties have in fact been uploaded for all recent judgments in decided cases. This is a valuable legal resource not previously available. Written by Simon NM Young (co-editor of Hong Kong's Court of Final Appeal (Cambridge University Press 2014)).